This two handled cup was traditionally used during wedding feasts to symbolize sharing between the newly wedded couple. The Scottish Quaich originated from the Gaelic word “cuach” meaning “shallow cup.” Pronounced “quake,” the quaich is an ancient vessel used to celebrate a bond between two clans or families, each partaking of the offered drink. Presented using both hands, the recipient must receive it with both hands. In earlier days this method of giving and receiving insured the safety of each warrior as neither could hide a weapon with a hidden hand. 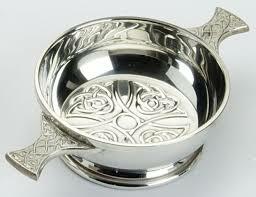 Continuing the tradition, the quaich is still serving its purpose today, uniting friends and the two families in the Celtic ceremony, or at the reception following.